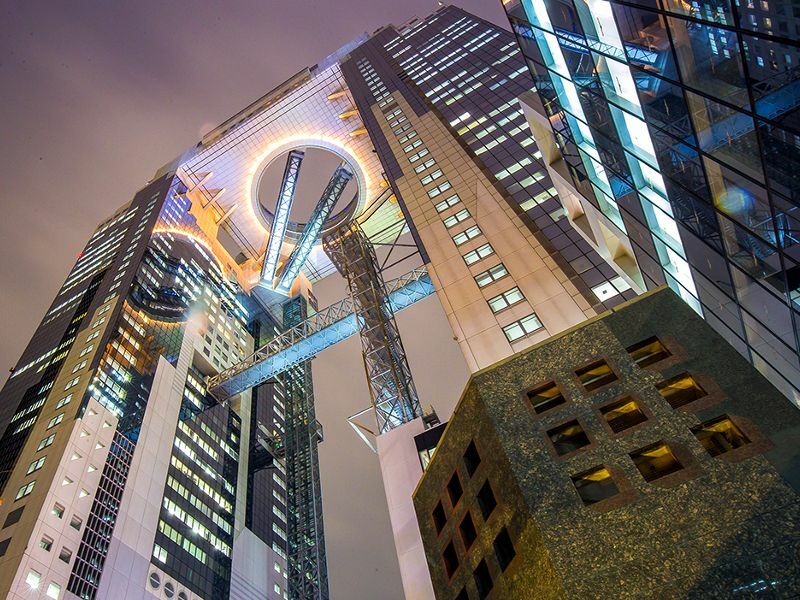 The Umeda Sky Building, also known as the “New Umeda City,” is one of the most unique high rise buildings in the world. How tall is this skyscraper? It is 173 meters (over 567 feet) tall and is, in fact, not one building, but two. The Sky Building’s two forty-story towers are connected at the thirty-ninth floor by the Floating Garden Observatory, where you can look out at Osaka through windows or an open-air deck. What else does the Umeda Sky Building have to offer? Beneath its many offices, the basement level hides a restaurant that replicates Japan’s Showa Period, during the first half of the twentieth century. On the third and fourth floor, you will find the Cine Libre Umeda, a cinema showcasing independent films from around the globe. Check out this handy travel guide to make the most of your trip to the Umeda Sky Building and its surrounding area. The Umeda Sky Building is located in the Kita district of Osaka, near both the Osaka Station City (JR) and Umeda Station (Osaka subway). In fact, it is a mere ten-minute walk from Osaka Station City through an underground passage under the train tracks. 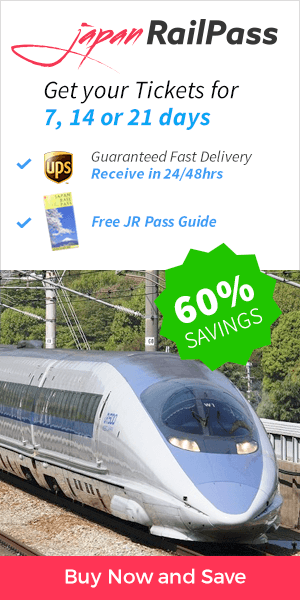 You can use your Japan Rail Pass to reach Osaka City Station from nearly anywhere in Japan. Since Osaka City Station is a train station on JR Osaka Loop line, is easily accessible from anywhere in Osaka. The transfer service from Kansai Airport, Kansai-Airport Rapid, also stops at Osaka City Station (1h and 10 minutes). If instead the Kansai-Airport Rapid you take the Haruka Express, you should stop at Tennoji Station and transfer to the Yamatoji line to Osaka Station City (about 50 minutes the entire trip). From Shin-Osaka, you can use the Tokaido Main line to arrive at Osaka City Station (4 minutes). The Umeda Sky Building is open daily from 9:30 am to 10:30 pm. However, admittance of new guests ceases at 10 pm. The building is open on weekends and holidays, but the opening time may vary on special occasions. Adult admission is ¥1500, or about $14.00 usd. Admission for children ages four to twelve is ¥700, or just over $6.00 usd. Children under four years of age are admitted free of charge. The Umeda Sky Building utilizes the highest escalators in the world. Two of the escalators even cross between the two buildings, spanning more than 550 feet of open air. 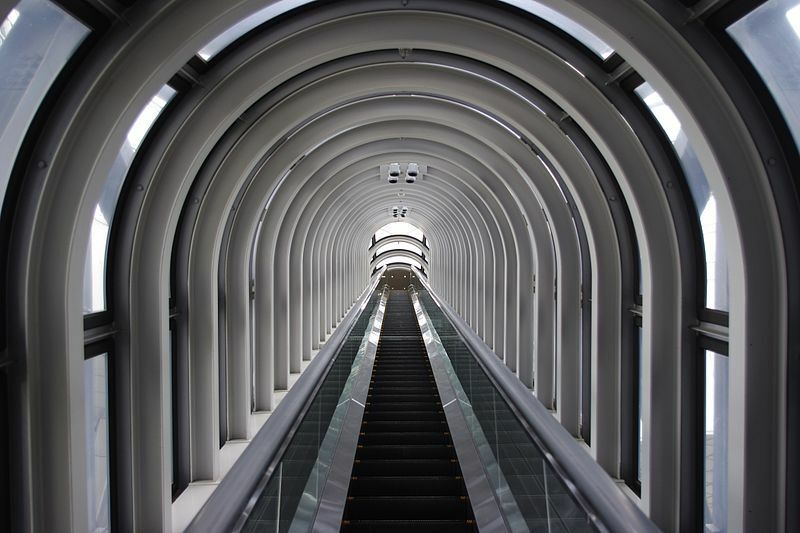 The escalators themselves will make you feel as if you’ve entered the realm of science fiction. Peer out the great glass windows, supported by rows of metallic arches. The Kuchu Teien, or Floating Garden Observatory, affords a 360-degree view of Osaka from 170 meters in the air. You can feel the wind against your face, and on a clear day, you’ll be able to see as far as the distant Awaji Island. Enjoy the view of Osaka by day, but don’t forget to see it by night as well. From the Observatory, you can look out upon a city laid before you like a blanket of stars. You may be wondering how long to spend at the Umeda Sky Building. 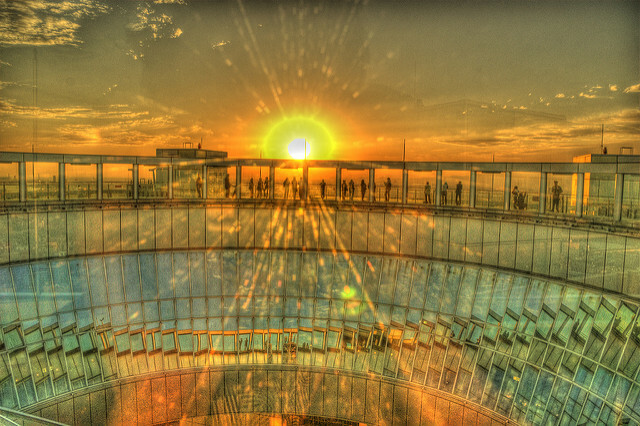 You may spend less than half an hour enjoying the observation deck, but longer if you desire to explore the unique shops and restaurants. On your way down from the observatory, you’ll find cafes and souvenir shops, such as the Umeda Skybldg Gallery Shop. The Sky Lounge Stardust offers a selection of around 300 cocktails. Or you can catch a movie at the Cine Libre Umeda. The basement level of the building houses the Takimi Koji, a replica townscape of 1920s Japan. The underground “town” includes a gourmet food alley. Okonomiyaki, meaning “grilled as you like it,” is a savory pancake and one of Osaka’s most popular foods. Pay a visit to Kiji, located in the Sky Building’s basement level food alley, for a taste of this delicious treat. The shopping street also includes a retro-style hair salon. While in the area, you may want to visit the Dotonbori, Osaka’s most popular entertainment district. To get from the Umeda Sky Building to Dotonbori, return to Osaka Station. Take the Osaka Loop line to Imamiya station and then, take the Yamatoji line to Namba Station, a trip covered by your JR Pass. Dotonbori is a short walk from the station.